**Just added- Edible Gifts for The Holidays: The time for giving is upon us! This hands-on workshop is right on time for little gifts of your own homemade small batch jams. Learn to make jewel- like jams in little jars to gift or serve at your holiday table. Takeaway 2 jars packaged for gifting, and the confidence to DIY! Bread Puddings 101 ◊Real Food For Entertaining + How to make caramel sauce.Make and take individual bread puddings and sauces (Salted Caramel & Lemon Curd)We add healthy seeds, fresh fruit,and whole grains without turning everything too “crunchy”! Learn to make these puddings and impress friends and family. It’s easier than you think! In this class we will learn to make easy condiments and salsas that compliment cheese platters and casual meals. We will also prepare a crowd pleasing main for any summer evening and talk about food strategies for keeping yourself healthy and happy. Learn to cook- and take a break! Canning 101:Preserving The Bounty – Introduction to small batch hot water bath canning. This class covers food safety and general procedures for a successful seal every time! This is a “hands-on” class with each participant taking home freshly made jars of seasonal goodness- plus recipes. (Ingredients vary by season).We will preserve fruit compote & dilly beans . Takeway 2 jars and the confidence to DIY! Canning 102: “Yes, I Can!”: Do you know how to can? Need a refresher? Would you like to experiment with new flavor trends and foods safely? This is not your grandmother’s kitchen (although I love your grandmother).Let’s get started right away…you already know the basics! Recipes vary. Takeaway 2 jars. Slow Jam Session: These jams take a little more time & can be a little more complex. We will not use added pectin, but learn to test for desired consistency. You will learn some tricks for infusing flavors into jam, and creating an artisanal product. Let’s get creative.Takeaway 2 jars. Summer Tomatoes and Salsas : In this class we’re doing everything tomato! Recipes include Original Gazpacho Salsa & Roasted Tomato Puree. 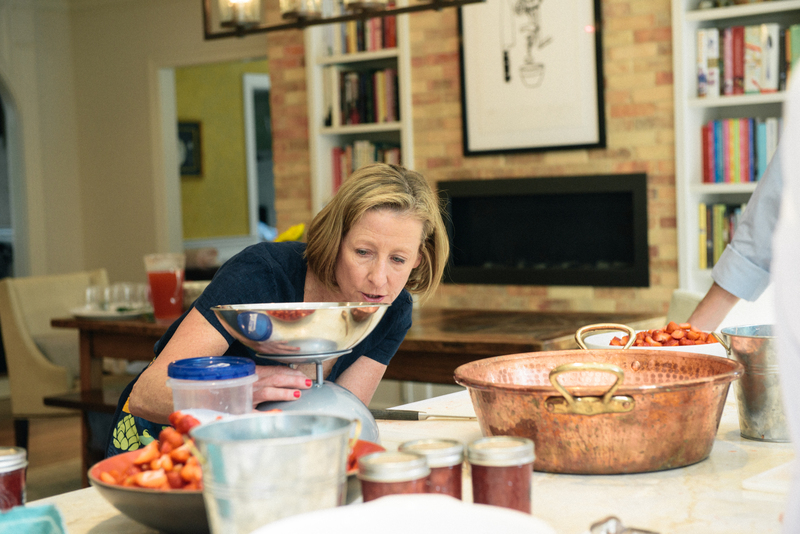 You’ll also learn how to can whole or diced tomatoes to enjoy all winter long.Takeaway 2 jars. Community Jam: Perfect for groups, clubs, and non-profit organizations. This is a loosely organized get-together in which I am your fearless leader. We combine continuous demonstration with a little hands on for interested foodies, and a tasting for all. A little social, a little work! Let’s get together and make something good. Creatively personalized for your needs. Infusion Workshop: Vinegars & Shrubs.Learn to make your own herb infused oils for dipping and recipes. Create flavored vinegars that are not only delicious,but beautiful to look at, and explore fruit shrubs and Fire Cider in creative combinations for cocktails and mocktails! Leave with one bottle of each.Great for home gardeners, garden clubs,and gift giving. Love Your Health: Infused Oils & Dark Chocolate Almond Bark ◊Heart healthy Omega 3’s and flavonoids come together to form a healthy luxury that ‘s not so bad for your health, and known to enhance your mood! We’ll learn how to make basil oil, and move on to individually designed organic chocolate bark. Perfect for Valentines Day! Sushi Rolling –Welcome to Japan! Introduction to sushi and how to put it together with healthy lunch combos for children & adults. BYO lunch the healthy way! Indian Vegetarian Cooking* – Biryani,Palak Paneer, and Lentil Dal Explore the spices of the silk road and prepare healthy and delicious Indian vegetarian recipes.You don’t have to be a vegetarian to love this food . Cooking on your Own ◊ (discounted class for singles over 21) Have a new Apartment? Job? Life? Want to learn the basics? Congratulations! We discuss food safety & storage, shopping and pantry basics, easy cooking methods, & make tons of easy recipes for any diet. You’ll leave with a toolbox of ideas for even the busiest person! Great for college grads, new roommates, and newlyweds. I am located in Westport Connecticut …but have kitchen? Will travel!